Natures forgotten creations and cross pollinated gems. The wonderful world of berries. 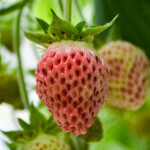 The Bubbleberry Strawberry is a high yielding, Heirloom variety with fragrant, soft pink strawberry fruits. It is sweet tasting in flavour with a bubblegum/mixed berry undertone. This heirloom variety, was popular in 19th Century, and referenced in Jane Austen’s novel ‘Emma’. Best consumed when pink. 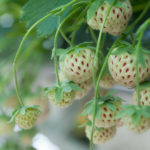 Pineberry Strawberry is a hybrid-cross variety with fragrant, white flesh fruit, with red seeds, and white blooms. Beautiful in appearance with flavour notes of strawberry and pineapple. If grown in full sun, fruit may have a blush tint. Fruit is best consumed cold. Requires a red strawberry to act as a pollinator. 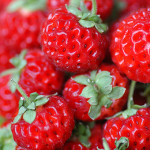 The Strasberry strawberry produces plump, juicy deep seeded fruit. Raspberry like in appearance, it is a sweet tasting, hardy strawberry with a mild, raspberry flavor. Requires a pollinator of 2 quality red strawberries in order to fruit. Requires a red strawberry to pollinate.